This muffin is very filling due to the fiber and a lots of protein. Perfect for your breakfast on the run. 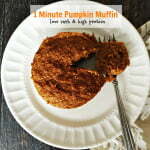 In a separate bowl add the almond flour, flaxseed, Swerve, baking powder and pumpkin spice. Mix well and add to egg mixture and mix again. Microwave for 1 -2 minutes. Check to see if done. Don't overcook. Mine took 1 minute and 40 seconds. Let cool a bit and eat.